You can a circumstance-qualify a case type rule with a single property, a date range, or a property and date range. In case management applications, circumstanced versions are referred to as specialized case types. Cover, or be covered by, other base or specialized case types. Be auto-instantiated (the system automatically copies the necessary value of the circumstanced property onto the subcase). Use attachment categories and auto-attach functionality. Be used in Add Work submenus on user forms. Specialized case types are useful in situations where a case has a process that requires variations in order to meet special business requirements. This article describes how you use the Case Designer to create specialized case types and their processes. Note: Circumstance templates are not supported. The company provides home loans in three counties. Assessments in each county have their own tax reporting procedures and information requirements. The department has assigned one case worker to each county. The application's business analyst has determined that specializing the Tax case type enables a tax case, each with its own process, to be routed and assigned to the appropriate worker. Create specialized versions of the Taxes case type. Create a starter flow for each version. Configure the covering relationships and the instantiation method in the parent Assessment's Case Type rule. Configure the starter flows in the specialized Case Type rules so that they appear in the action area header's Other Actions > Add Work > add case submenu. 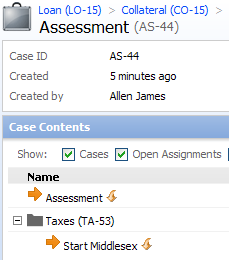 Open the Case Designer ( > Process & Rules > Case Management > Case Designer) and select Taxes on the case types tree. On the Details tab, select the Specialization item (Edit) link. 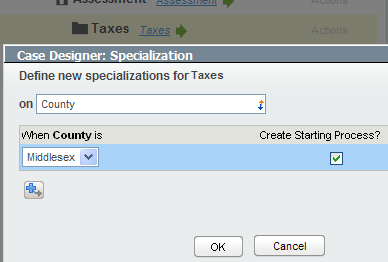 Select the Single Value property County in the Define new specializations for Taxes on field. Click the Add Row icon ( ). Select Create Starting Process? so that the system creates a non-circumstanced copy of the starter flow Work-.pyStandardCMAssignment for this specialized case type. The name is a concatenation of the word "Start" and the property value. This flow does not appear in the Starting Processes list on the specialized Case Type rule form or on the case types tree. On the Application Explorer, it appears but is not marked as a starter flow. Add two more rows and select Norfolk and Suffolk. Click OK to close the dialog. The thee new specialized case types appear on the tree beneath the base case type Taxes. By default, the Taxes starter flow is copied to each version. 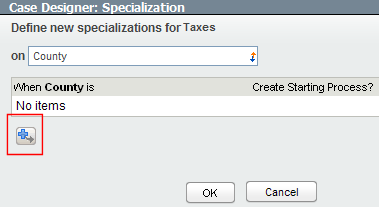 The Specialization item indicates that Taxes has three specialized versions. 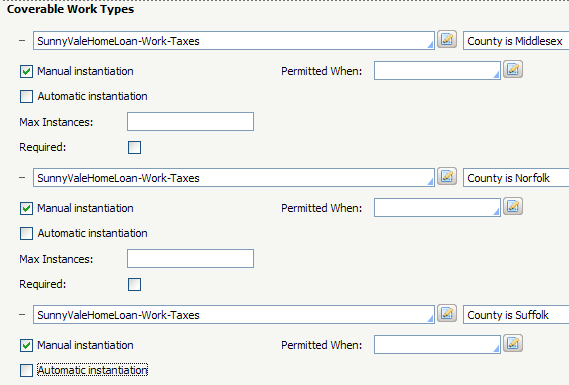 On the Application Explorer, the starting processes you created in the dialog appear as non-starter flows in the Taxes case type. You can test these three flows by clicking the Run icon ( ) on the Flow rule form. On the Case Designer, select Assessment. Select the Actions > Open menu item to open its Case Type rule form. 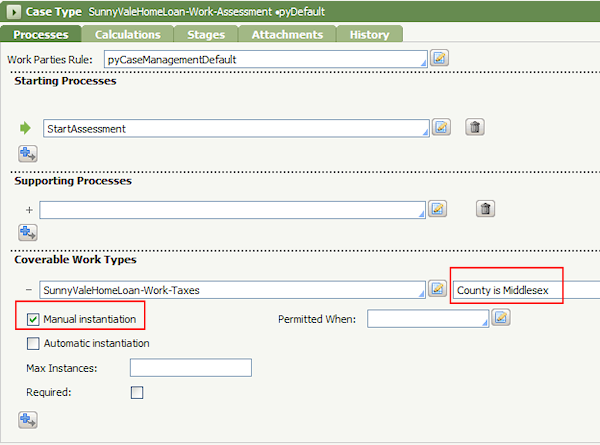 In the Coverable Work Types array on the Processes tab, select County is Middlesex in the field to the right of the Taxes case type Applies To class. If the right field does not appear, move your mouse pointer to the right of the first field and click. Clear the Automatic instantiation checkbox. 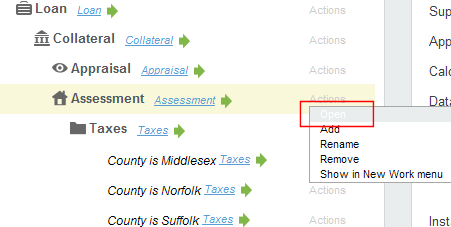 Add two more rows, enter the Taxes case type Applies To class in the left fields, and County is Norfolk and County is Suffolk in the right fields. Clear the Automatic instantiation checkboxes. Save the case type rule. 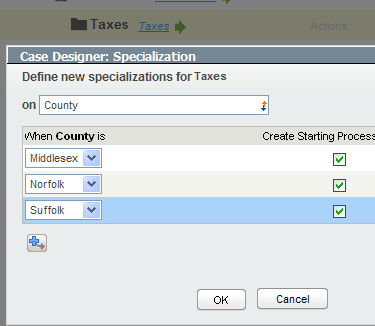 On the Case Designer, select the County is Middlesex version and open its case type rule from the Action menu. In the Starting Processes array on the Processes tab, replace the default StartTaxes process with StartMiddlesex, and save the rule. 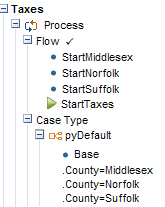 Replace the flows in the County is Norfolk and County is Suffolk Case Type rule forms. The flows do not appear on the Case Designer case types tree. 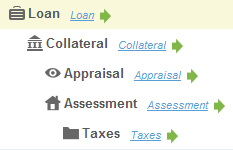 Create a Loan case, and subcases Collateral and Assessment. In the action area header on the Assessment perform harness. select Other Actions > Add Work > Start Middlesex. Create the specialized Taxes subcase in the new harness. In the Taxes perform harness, click the Assessment link. This opens the Assessment review harness. The Start Middlesex process has started.